Katharina Dittmar de la Cruz holds both a Ph.D. in Molecular Parisitology and Entomology and a doctorate in Veterinary Medicine, both from the University of Leipzig, Germany. ?An expert in phylogenetics, molecular evolution, and bioinformatics, she has recently turned her attention toward examining the implications of evolutionary forces on drug design.?Dr. Dittmar is an Assistant Professor at the SUNY University at Buffalo. David Liberles earned his Ph.D. in Chemistry at the California Institute of Technology working on the biochemsitry of nucleic acids. ?Subsequently, he has developed significant expertise in bioinformatics, computational biology and functional genomics. ?His broad experience includes a professorship at the Stockholm Bioinformatics Center and consultancies with Novo Nordisk and other private research and diagnostic companies. ?Currently he is Vice-Director of the University of Wyoming Bioinformatics Center and Assistant Professor of Molecular Biology. 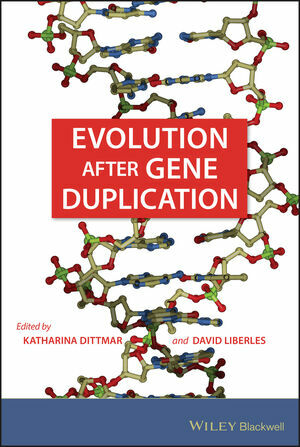 1 Understanding Gene Duplication through Biochemistry and Population Genetics (David A. Leberles, Grigory Kolesov, and Katharina Dittmar). 2 Functional Divergence of Duplicated Genes (Takashi Makino, David G. Knowles, and Aoife McLysaght). 3 Duplication Retention After Small- and Large-Scale Duplications (Steven Maere and Yves Van de Peer). 4 Gene Dosage and Duplication (Fyodor A. Kondrashov). 5 Myths and Realities of Gene Duplication (Austin L. Hughes and Robert Friedman). 6 Evolution After and Before Gene Duplication? (Tobias Sikosek and Erich Bornberg-Bauer). 7 Protein Products of Tandem Gene Duplication: A Structural View (William R. Taylor and Michael I. Sadowski). 8 Statistical Methods for Detecting Functional Divergence of Gene Familiies (Xun Gu). 9 Mapping Gene Gains and Losses Among Metazoan Full Genomes Using an Integrated Phylogenetic Framework (Athanasia C. Tzika, Raphaël Helaers, and Michel C. Milinkovitch). 10 Reconciling Phylogenetic Trees (Oliver Eulenstein, Snehalata Huzurbazar, and David A. Liberles). 11 On the Energy and Material Cost of Gene Duplication (Andreas Wagner). 12 The Fate of a Duplication in a Network Context (Orkun S. Soyer). 13 Evolutionary and Functional Aspects of Genetic Redundancy (Ran Kafri and Tzachi Pilpel). 14 A Phylogenomic Approach to the Evolutionary Dynamics of Gene Duplication in Birds (Gene L. Organ, Matthew D. Rasmussen, Maude W. Baldwin, Manolis Kellis, and Scott V. Edwards). 15 Gene and Genome Duplications in Plants (Pamela S. Soltis, J. Gordon Burleigh, Andre S. Chanderbali, Mi-Jeong Yoo, and Douglas E. Soltis). 16 Whole Genome Duplications and the Radiation of Vertebrates (Shigehiro Kuraku and Axel Meyer).